As a popular golf blog I receive a lot of product submissions for review. So many that I can’t possibly get to them all. I prioritize them as best I can, and review the ones I think the HOG readers will be most entertained and informed by. Over the years I started to receive food submissions strangely enough. I received so many in fact, that I started up an entirely different web site to review food and beverages. That site isn’t worked as much as HOG, but I do regularly post those food/drink reviews over at Megachomp.com. Check it out. 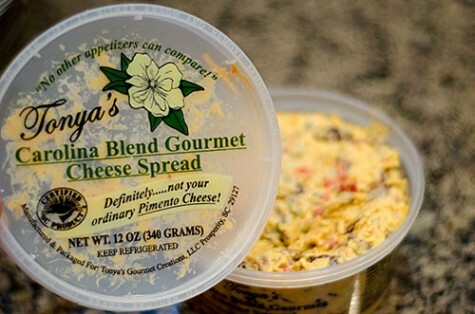 I’ve been greatly enjoying Tonya’s Carolina Blend – Gourmet Cheese Spread. This is a very tasty pimento cheese blend with all sorts of other good stuff in there including diced olives and jalapenos. Tonya’s calls their spreads appetizers but I make “sammiches” from them which rival those I’ve had at Augusta National. Other suggested uses are as toppings on hamburgers or french fries. I may need to try that. A tub of the spread runs $5.99 from Tonya’s web site, a lot cheaper than Masters tickets! I’ll be posting about the other spreads I’m trying on Megachomp.com, so watch for the rest there! Happy chomping. Jumeirah Group announces closure of their contract with Rory McIlory. Nike announcement presumably coming soon.